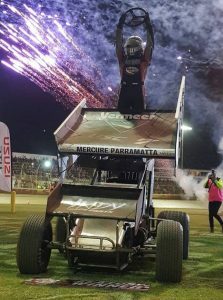 Robbie Farr, Far and away the best at the 47th Grand Annual Classic | Talking Speedway, Speedway news from around the world! Speedway’s classic journeyman Robbie Farr is never far from the action but down south during the 47th running of Australia’s Premier Sprintcar race the 40 Lap Grand Annual Classic the ‘2004 Australian Sprintcar Champion proved the depths of his undying talents with wins in the preliminary feature on night two and a win in the one that’s counts the 40 Lap Championship final. 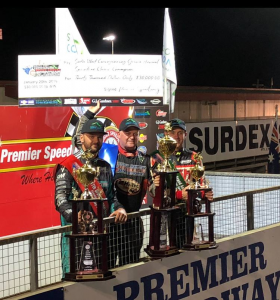 With the best of the best including the normal influx of US drivers Farr was far and away the best on the night claiming the $40K on offer to the winner. This was Robbie Farr’s first win in the Classic, his previous best was a third behind Jamie Veal in the 2016 Classic. Farr told the Warnambool Standard ““It’s been 30 years, the longest apprenticeship to win this race,” Farr said post race. The Grand Annual Classic is considered second only to the Knoxville Nationals and a race win that has been on Farr’s bucket list for over 30 years, now ticked off! This entry was posted in Sprint Cars by admin. Bookmark the permalink.